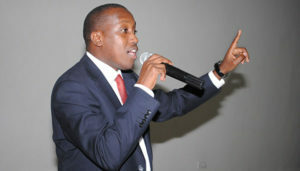 MP Gerald Karuhanga is one of the suspended legislators. File photo. Seven MPs have been suspended following a heated debate on the Age Limit Bill on Monday morning. Among those suspended include Gerald Karuhanga, Ibrahim Nganda, Mubarak Munyagwa, Moses Kasibante and Allan Ssewanyana. The Age Limit Bill had returned for a second reading. Despite protests from Opposition MPs, Kadaga allowed the second reading to go on, a move that attracted procedural protests throughout the presentation.